The Macworld 2003 rumor was the unveiling of the Video iPod. Biz Stone shows you how to make a Christmakkuh miracle. Give biz bloggers a break! Don Park proposes that learning can be fun, so don't kick students in the teeth. Donate your unused frequent flier miles to American troops. Cool! The lights in our office are still swinging but I didn't feel it. I was in the elevator. It looks like folks down south might not be so lucky, it's being reported as a 6.4 centered in San Simeon, CA. Folks in the office who aren't native Californians aren't taking it well. Goldman is lying down as we speak. The guy that wrote this article Oakland Tribune: Monster quake could hit Pacific Northwest must feel like a mini-Nostradomus this morning. Many residents still believed drunk. This is going to rock the Blogger/Google UI casbah! Button detail of the Toto Washlet - December 2003 I doubt the button depicted above is used in the mens room, but you never know. To those who ask 'Why are you taking pictures in the washroom', I say 'Do you have the toilet of the future in your office?'. I bet if you did you would want to capture it for all to see as well. You can always get a Bidet Ole or a Travel Washlet if you don't have the funds for the real deal. My guess... it's worth the extra 11 cents for the Apple Experience. Blogger drops knowledge for the 10 of you who can't seem to close the deal. Great names for some interesting hacks. Only 24 more hours with this hideous Spider-Man template in place, however a deal is a deal and a buck is a buck. An odd side effect of this template change is a breakthrough in my months long bloggers block. I can feel my normal blogging self coming back to life. I think it might have something to do with figuring out what is bloggable within the confines of a much larger company than I was used to a year ago. Either way it feels better and I hope to keep it up. Quantity over quality may however prevail. update: Ahh... much better. 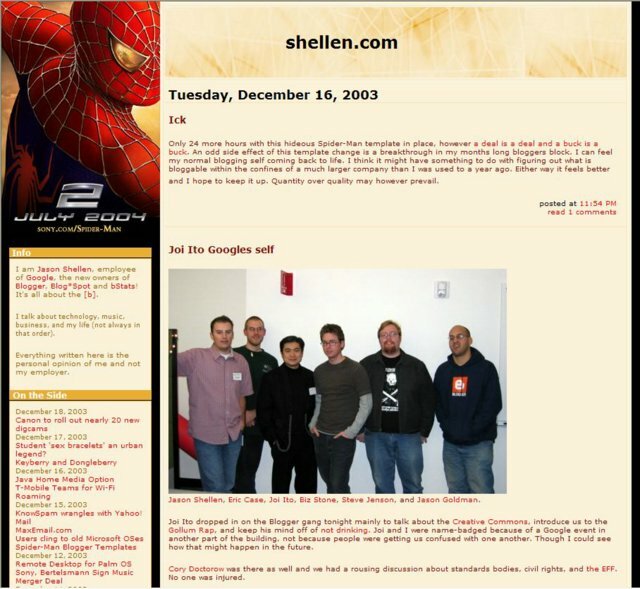 Archived for posterity, 48 hours of shellen.com in Spider-Man skin. Jason Shellen, Eric Case, Joi Ito, Biz Stone, Steve Jenson, and Jason Goldman. Joi Ito dropped in on the Blogger gang tonight mainly to talk about the Creative Commons, introduce us to the Gollum Rap, and keep his mind off of not drinking. Joi and I were name-badged because of a Google event in another part of the building, not because people were getting us confused with one another. Though I could see how that might happen in the future. Cory Doctorow was there as well and we had a rousing discussion about standards bodies, civil rights, and the EFF. No one was injured. Alert reader, Luiz Eduardo writes in: From today on, for new users, blogger.com.br is no longer free. It is part of the "Globo Media Center".Interesting. Add internet connectivity to your TiVo... sort of. I'm a little tired of eFax. I'm going to give this one a try. My Win 3.1 machine is just fine, thank you very much. I likes my music companies ginormous, how about you? They used HotorNot.com for the study. Funny that a study was needed to prove this. Blog Meetup SF - [b] there! While we are usually busy writing code, dreaming up things to code, or generally making wacky faces on the bloggercam, the Blogger team is going to take a rare public appearance at the SF Blog Meetup. It's next Wednesday, December 17th at 7PM (location and details TBD) and we are hoping to meet a large throng of hoodie wearing Blogger users. Hope to see you there and please help spread the word! From Tech Law Advisor:If congress bans net taxes then states "stand to lose billions in local telecommunications taxes on phone service. With voice service moving rapidly to the Internet, there is little to stop your local phone company from saying the $50 you are paying them each month is for Internet access and not phone service, and should thus be tax-free." [WSJ] Sounds like a gain for consumers though. Making bicycles even more useful. These guys re-enact the Pearl Harbor attack. I wonder how people would feel if 50 years from now people wanted to re-enact the WTC attack. Probably 'not good'. Nikon D70, coming to spoil Canon's party? I think I'm still going for the 300D. I feel an executive branch scandal coming on. Scene: I am working from home and instant messaging with my friend and colleague, software engineer Steve Jenson. Steve: I wanted to talk to you about X. Me: I could give you a call now. What's your extension? Steve: talk about it with our voices? voices? Me: yes, with our live actual voices. Steve: well, it'll be going through a massive computer system so I guess that's ok. ...and scene. David Wertheimer's new consulting business with a user experience blog to boot. I think they are trying to say their email client does RSS.